Rainbow Ice: Silica, natural and artificial flavors, citric acid, sucralose, malic acid, acesulfame k, salt, and FD&C Blue No. 1. Snow Cone: Natural and artificial flavors, silica, citric acid, sucralose, malic acid, maltodextrin, acesulfame k, and FD&C Blue No. 1. Watermelon Freeze: Silica, natural and artificial flavors, citric acid, sucralose, malic acid, acesulfame k, maltodextrin, salt, and FD&C Red No. 40. Take one (1) serving (1 scoop), blended into 8oz of ice cold water, with or without food in the morning and one (1) serving (1 scoop) in the evening, or as recommended by a healthcare practitioner. HOW DO I TAKE CLA + CARNITINE? CAN CLA + CARNITINE CAUSE YOU TO GAIN WEIGHT? No, this product has ingredients designed to help you burn fat. The calories from this product won't add water weight or fat storage. CAN THIS BE ADDED TO A MEAL REPLACEMENT POWDER? 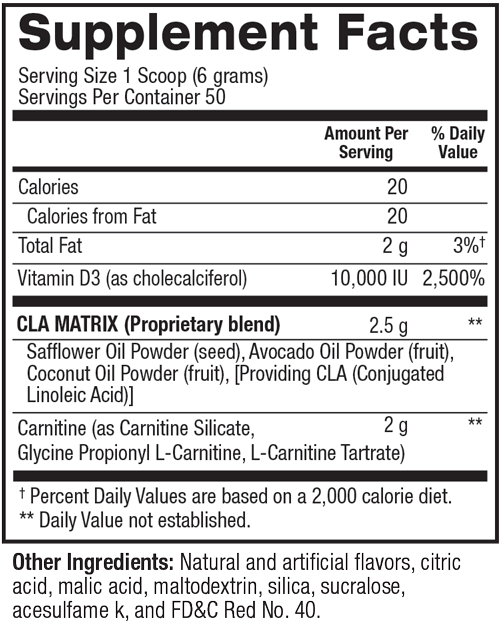 CLA + Carnitine can be added to your meal replacement or just about any beverage. IS THIS GOOD FOR A KETO DIET? CLA + Carnitine is keto friendly. We also offer "Keto Aminos" which are specifically designed for ketogenic diets.